Gold Medal Products' #2488SR Pop About Popper addresses two common challenges in the rental market: ease of transport and inadequate power. This special version of the Super 88 has acrylic front and side panels in place of heavier glass. The side panels also have convenient handholds that provide a natural place to lift and carry the popper. The doors are 50 percent thicker and cannot lift off accidentally. Gold Medal also includes cord-wrap brackets for the power cord. The 2488SR has exclusive Energy Management Control that ensures the popper gets a steady 120v regardless of the receptacle voltage. The SICO Pacer is designed to take the work out of setup, tear-down and trips to storage. 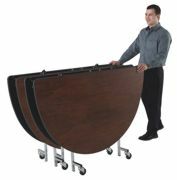 These tables fold and roll quickly and easily into storage and back into action the minute you need them. Because SICO Pacer tables store on their own built-in wheels, their tops are not subjected to the constant punishment that conventional folding tables endure. The exceptionally attractive high-pressure laminate top and Armor-Edge also give facilities the option of eliminating linen or skirting. With faster turns and linens as an option, not a requirement, labor is reduced and savings increased. For as little as $5,000 and a half a basketball court, you can have a Freshpark skatepark just like those used in the top pro skate tours. This durable line of weatherproof, foldable ramps is easy to assemble, move and store. With layouts scaled for any budget, they're perfect for recreation departments, community organizations, schools and summer camps. BCI Burke's Circuit Play® builds muscles while challenging minds and transforms the concept of play. Circuit Play is an innovative play system that promotes physical strength, stamina, balance and agility while expanding self-esteem and creativity. Design layouts use play components placed in a circuit to encourage children to challenge themselves and their friends. No decks are required of this playground-meets-obstacle-course because all events are at ground level. Circuit Play encourages multiple paths of play and the creation of stimulating games to captivate children ages 5 to 12. Variations of design and layout are extensive. The Aqua Series Fractional Aerator is complete with two interchangeable spray patterns and is designed with the small pond owner's needs in mind. Ready to install right out of the box, Aqua Series provides both aesthetic appeal and aeration, taking care of your water quality management needs. Newstripe's all new Dirt Doctor JrTM infield groomer has been designed specifically to be pulled by four-wheel-drive utility vehicles or compact tractors. It shares the same great features and rugged durability of the original Dirt Doctor but weighs in at just under 600 pounds. Dirt Doctor Jr replaces three separate implements in one convenient unit. It can plow, pulverize, drag, compact and finish-drag a 4-foot-wide path in one pass. The three-position reversible harrow teeth, four-position pulverizer bar and wheels are quickly and easily adjusted without tools. The optional 6-foot finish drag with reversible lead bar can be detached and used as a separate pull-behind drag for between-inning touch-ups. Cretors and Company's Echols line of high-speed ice shavers are ideal for the amusement and entertainment industries and an attractive and highly efficient primary element in the making of snow cones. Cretors' high-speed ice shavers, which fit securely on display cases or a counter stand, feature heavy-duty cast-aluminum construction for years of reliable use. The machines can shave up to 500 pounds of ice per hour, and for operator convenience, the shaver can use ice in sizes ranging from small cubes to 4.5-inch chunks. The Echols line is available with either gas or battery power. The perfect screen solution to upgrade your club to digital-broadcast-ready personal screen entertainment. The AXS15HD displays a super-sharp high-definition picture with rich color and dynamic contrast. The built-in digital ASTC/QAM tuner receives and decodes off-air and unscrambled digital signals directly, so that you may be able to view high-definition programming without an additional set-up box. 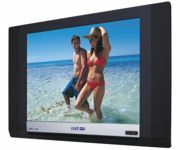 The AXS15HD screens can be positioned in front of cardio exercise equipment or used with manufacturer-attached mounts. With the AXSTV screen controller, all your members need to do is plug in their headphones and select their preferred program.